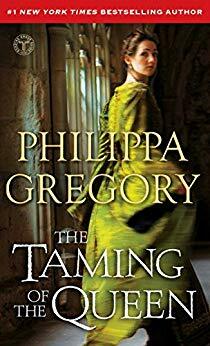 I have read several of Philippa Gregory’s book – not all of them, but a good many; The Taming of the Queen is one of her best. I think that Gregory’s writing has gotten better with time. Even though she has said in interviews that her Wildacre trilogy is her favorite set of works, I couldn’t get through the first one. I was also disappointed with The Constant Princess (couldn’t finish it) and The Other Queen took me forever to get through. However, I loved all of the books in her Cousin’s War series and The King’s Curse (which also came out this year). Clocking in at 464 pages, it was not quite as long as The King’s Curse (over 600 pages), but The Taming of the Queen only covers the nearly four years that Kateryn Parr (her name is spelled several ways, but this is how Gregory spells it in the book) was married to Henry VIII while The King’s Curse covered nearly the last 50 years of Margaret Pole’s life. Even though Parr’s marriage to Henry only lasted three and a half years, it was a harrowing experience. Henry’s views on religion were erratic during his final years, some days favoring Church reformers, other days favoring Church restorers. Parr, a reformer, had to survive these wild swings in her husband’s policies, and almost didn’t. Indeed, many people who once parroted the king’s views found themselves on the pyre later. Parr lived under the constant threat of terror from her husband, never knowing if she would follow in the footsteps of the queens before her, either cast aside or murdered. In the end, she probably only kept her head because the king died first. It would only have been a matter of time before he sent her down the river to the Tower. Even though The Taming of the Queen covers only a small part of a very large story, it is an important one that is often overlooked. Kateryn Parr was a very interesting woman, and it is nice to finally read the story of the Tudor queen who survived! Have you read The Taming of the Queen or any other Gregory works? What did you think? Did you enjoy this review? Check out all my reviews here. If you have a book you would like me to review, in any genre, please shoot me an email at LeighAndersonRomance@gmail.com. ← Interview With Nancy Herriman, Author of "No Comfort For The Lost"